Whatever you say about Russia, it would probably be an understatement. Every aspect of life is more or less different there than any other place on Earth. Apparently this goes for the weddings, too. 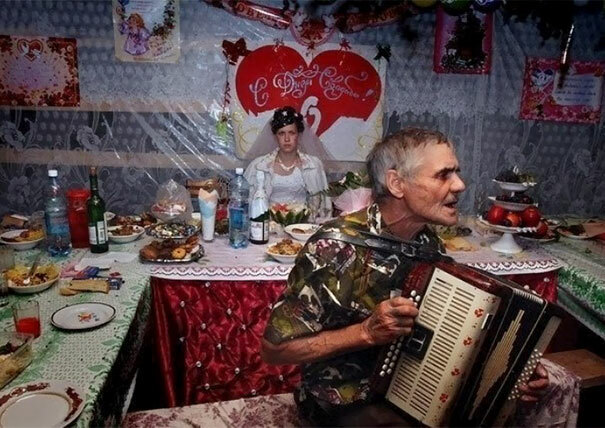 With the notorious Russian love for parties and alcohol, you could imagine the kind of event the typical modern Russian wedding is. 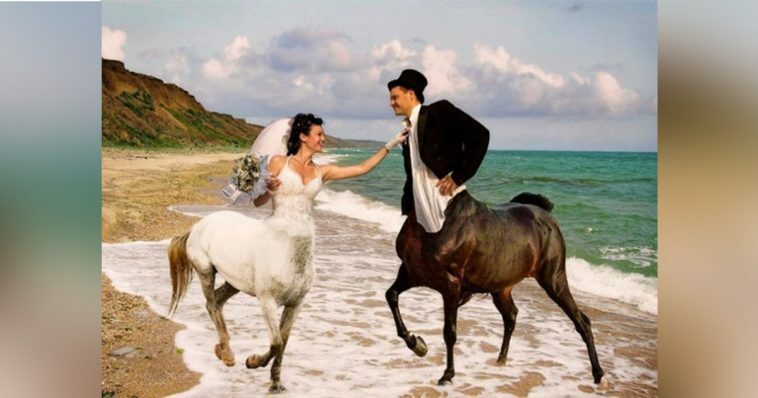 However, if you haven’t been to one, we are glad to provide you with some photos of weddings that are beyond strange, wild and crazy, but they all are hilarious! 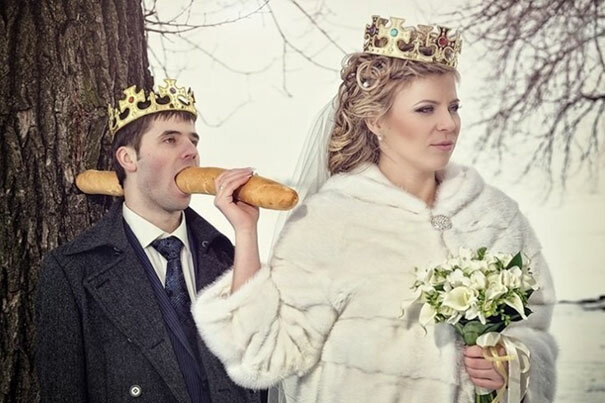 Enjoy these 15 ridiculous Russian wedding photos and choose your favorite – you would find it hard to do, trust us! And no, the message is not that the broom loves watermelon a lot. 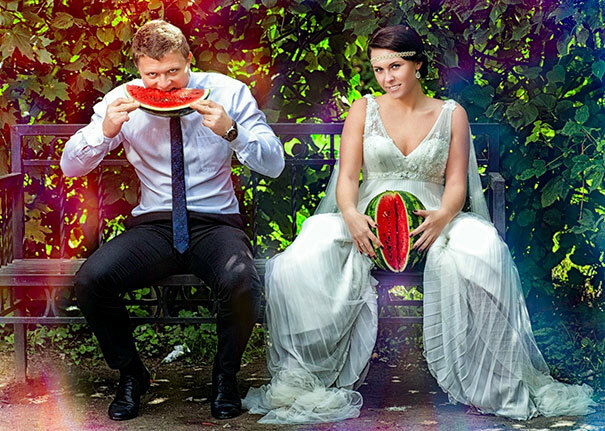 What the image is implying is that he will probably do to his new wife the same thing he is doing to that slice of watermelon. The question here is who composed the image. Judging by the bottles aligned in the photo, alcohol probably played a vital part in creating this masterpiece. 3. Kind of awkward, don’t you think? 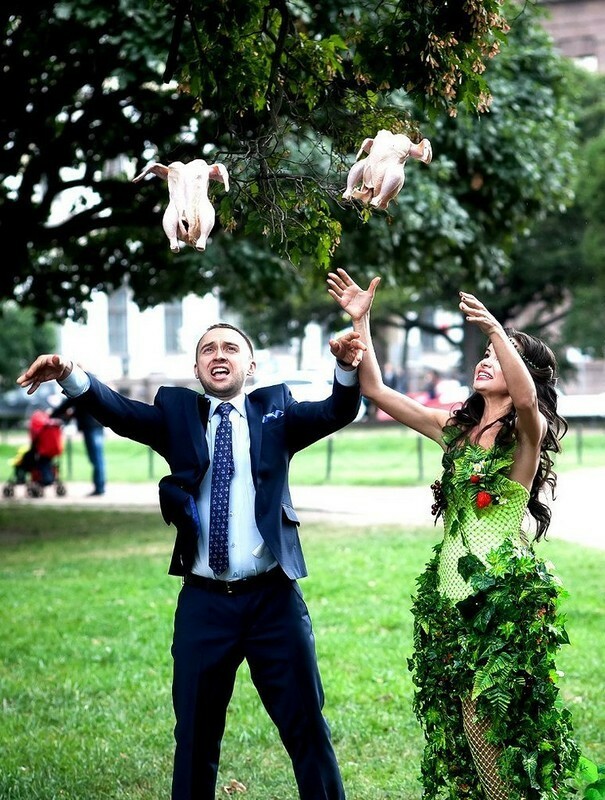 Typically the newlyweds release a pair of white doves, but this couple obviously had something else in mind, and while these may still be doves, they wouldn’t fly much higher, would they? We don’t even want to ask what’s up with that dress. This woman appears to know what she wants, and she is definitely keeping her husband, regardless of what he could do about it if he wished to. The hilarious photo speaks a thousand words and we wish the groom good luck. 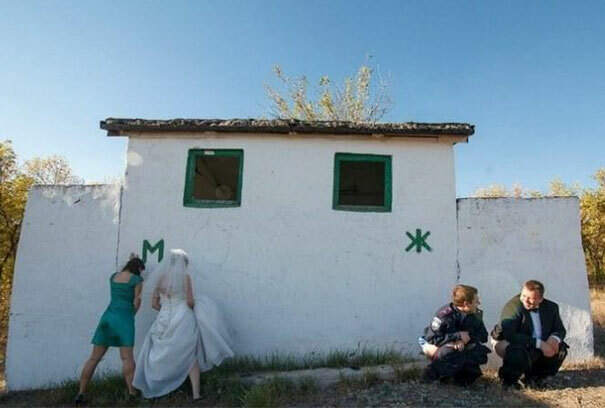 It seems that the bride had enough of her marriage, if we could read her facial expression correctly. The photo must have been taken at the end of the party, because there is literally nobody on the table around her. We must mention the décor, too – this is some fancy stuff. The idea behind this was not actually that bad, but the photographer did not do a good job taking and editing the photo. 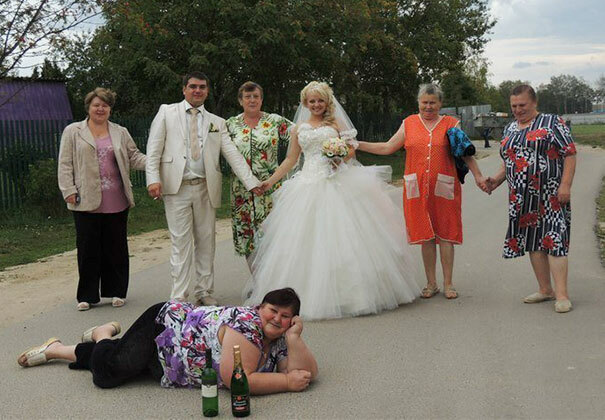 But it is still a classic image – the bride, the groom and a bottle of alcohol. We have absolutely no idea what is going on here, besides the obvious fact that they switched the typical peeing pose. 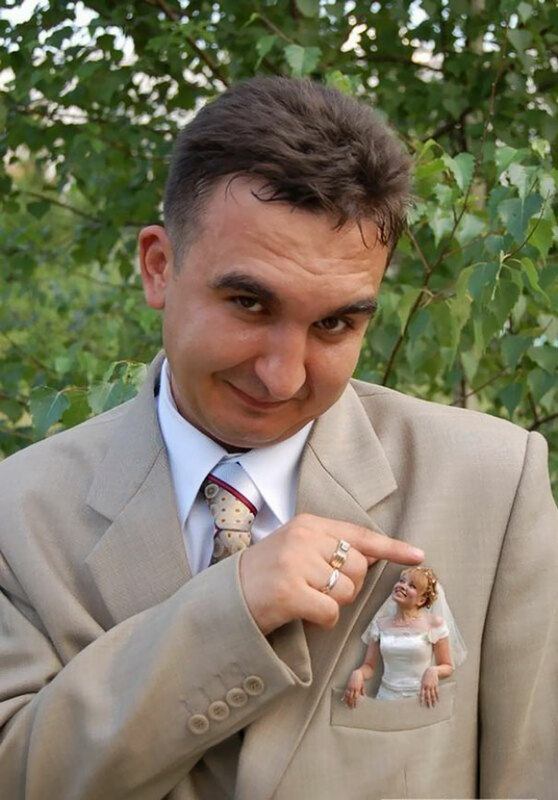 Talking about an awkward wedding photo, this one must get a complimentary prize or something. The idea behind this photo is unclear, but if it was supposed to be cute, they could easily consider it a fail. Having your partner in your jacket pocket is not the best way to show respect, but who are we to judge. 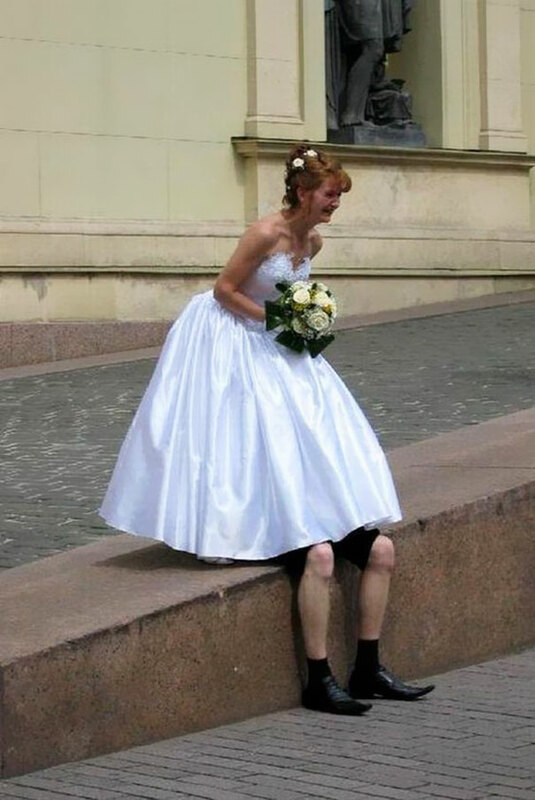 That is probably the reason why this bride decided to take matters into her own hands. Having the right moves guarantees that everyone will remember the dance, and even we remembered this one. 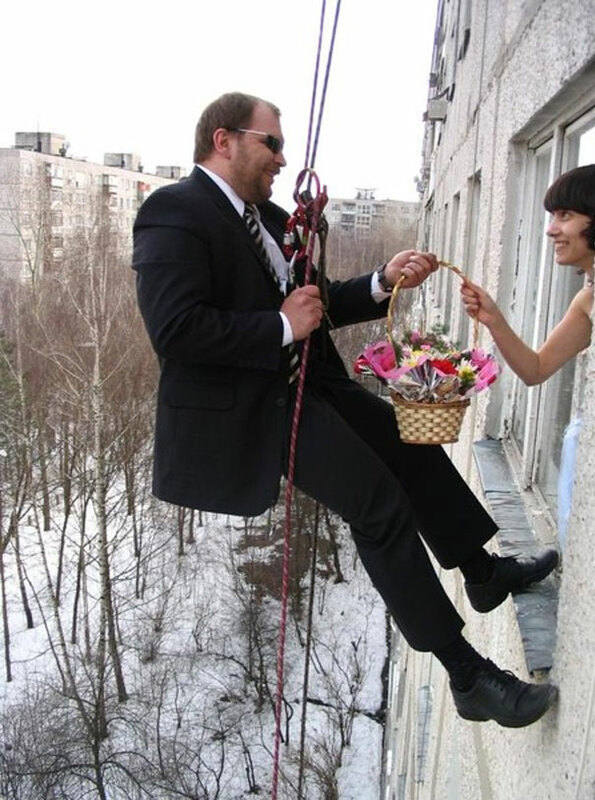 Russian weddings seem more fun than expected. Another possible explanation is that probably the groom decided to show everyone that he trusts his wife to the point where permanent damage could be caused. 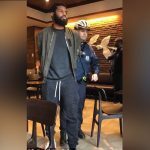 No matter what the case is, the photo is one of the strangest on the list. Of all the weird ideas, they had to do this! It’s so bizarre that even the bride could hardly take it, obviously. Yes, it’s kind of funny, too, but not that much to be appreciated. 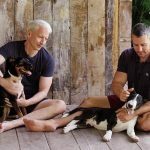 If we must be honest, it looks like these two have a huge sense of humor, and that is why they probably chose to do a photo like that. However, seeing the groom in the position he is makes us feel more or less sorry for him. 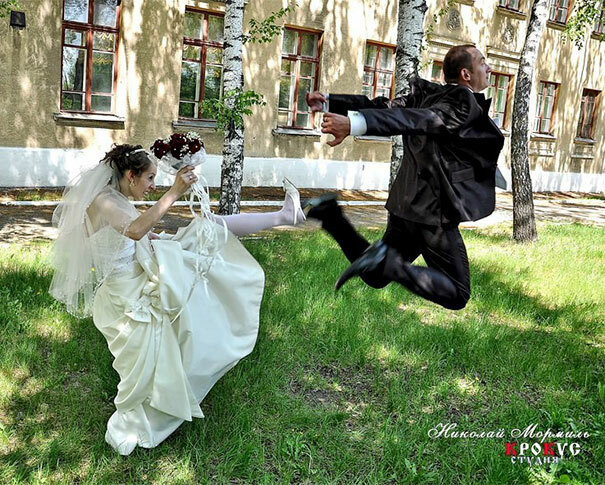 This Russian couple decided to add a twist to their wedding photos and made them Rapunzel-style, but the end result is a bit controversial. But hey, who cares about how things look in the photo, the important thing is the newlyweds’ happiness, and these two look happy. 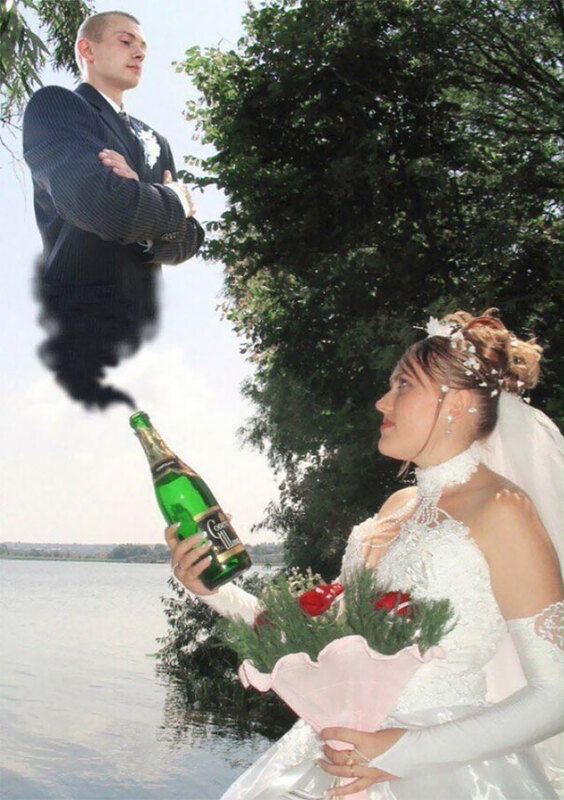 This couple chose to create an interesting wedding photo. The funny part is that usually this type of relationship is more common if the time for a divorce comes, not for a wedding, but people have their own ideas about this and that. Any suggestions about what this should represent? 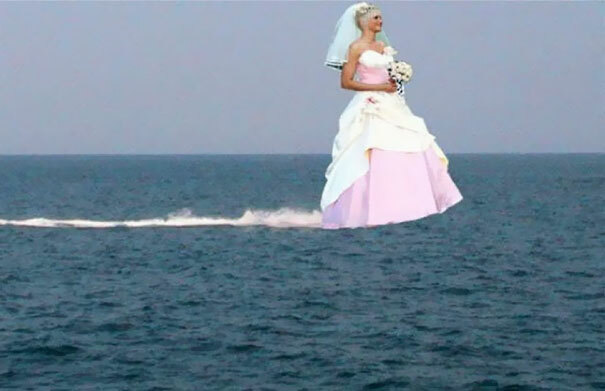 It looks like a picture of a jet-ski with the bride’s image photoshopped on top of the jet-ski, and it probably is exactly that. 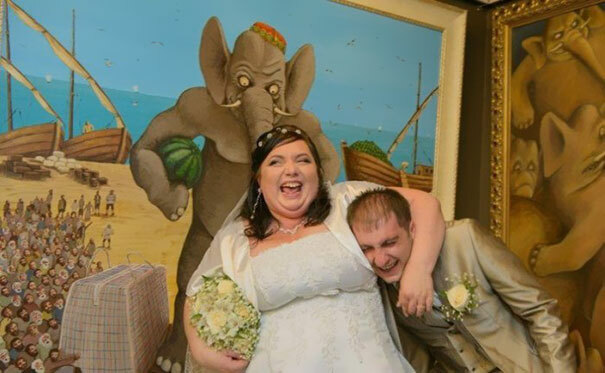 This photo is a serious competitor for the ‘weirdest wedding photo’ competition, if such a thing exists.